These couplets can turn any lead into a multiple lead. Allows up to 13" between dogs. Steel-welded 1" O-Ring. Solid brass bolt snaps. Vinyl-coated cable enclosed in clear plastic tubing. Very wear and water resistant. Available in colors Red or Blue. 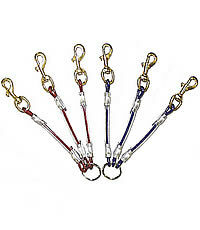 Colored straps are 7" long, plus the snaps, plus the o-ring equals approximate total length of 18 inches when folded out.